Each time we move it takes us about 45 minutes to settle in to our new dwelling. 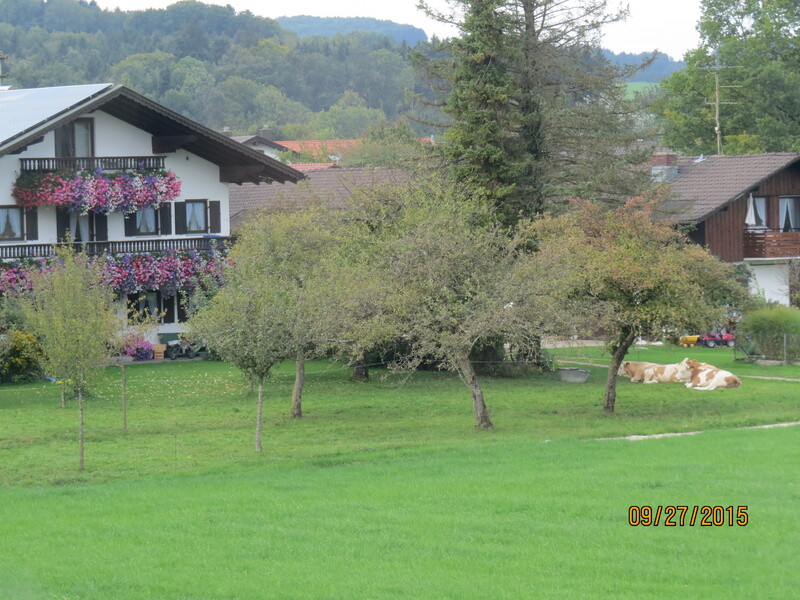 (This time our location was unique…small resort town with cows in neighbor’s front yards.) Our routine usually involves unpacking our clothes, checking out the location and contents of the kitchen (which usually dictates what sorts of meals we cook), hook up our Chromecast, figure out the internet and log our phones, tablet and computer onto the wifi. We’ve pretty much got it down to a science. Because we had a glitch with our phone (which we only use for a rare phone call and text messages) I had difficulty connecting with our landlord in Prien and we decided to go to the grocery store while we waited to get into our apartment. Grocery shopping in a foreign country can be an adventure. Using pictures on packaging as context clues and guessing at some words usually gets the job done, but we’ve had some interesting confusions from time-to-time. For instance figuring out bacon from prosciutto is hard. Another time I bought croissants for our egg salad sandwiches only to find out when I sliced them open the day after I purchased them that they had ham inside. Since they hadn’t been refrigerated, out they went! Better safe than sorry. On our first full day in Prien we headed to the train station for information. Generally every tourist information place we’ve gone has someone who speaks fluent English. The train station was no exception. The clerk was very helpful showing us the schedule and which trains we wanted and where to get on and off. Munich is an easy destination from here. The train is about a 5 minute drive from our apartment and in one hour we are in the center of Munich. For 30€ the ticket is good for the two of us on all Bavarian transportation for 24 hours. Salzburg, on the other hand, is a different story. It’s the Bavarian terminus the other direction but the clerk told us we didn’t want to take it. I asked if we were better off to drive. No, she said, we didn’t want to drive. I couldn’t figure out what she was talking about. Everything I had read said that it was an easy 45 minute train trip from Prien to Salzburg. Austria is part of the Schengen agreement, meaning borders are not controlled. I just didn’t get it. Then it struck me! Because of the huge emigration movement from Syria, people are trying to get to Germany because of their generosity in helping the refugees. Thousands and thousands of refugees are streaming into Germany from Salzburg on a daily basis, packing trains and train stations. Cars and busses also transport thousands daily. Because of the overwhelming number of people coming for a better life, the Germans temporarily closed the border allowing only EU residents entry (putting into question the validity of the Schengen agreement). The result is an amazingly congested, slow moving crossing from Austria into Germany. Our trip to Salzburg will have to wait until another time! 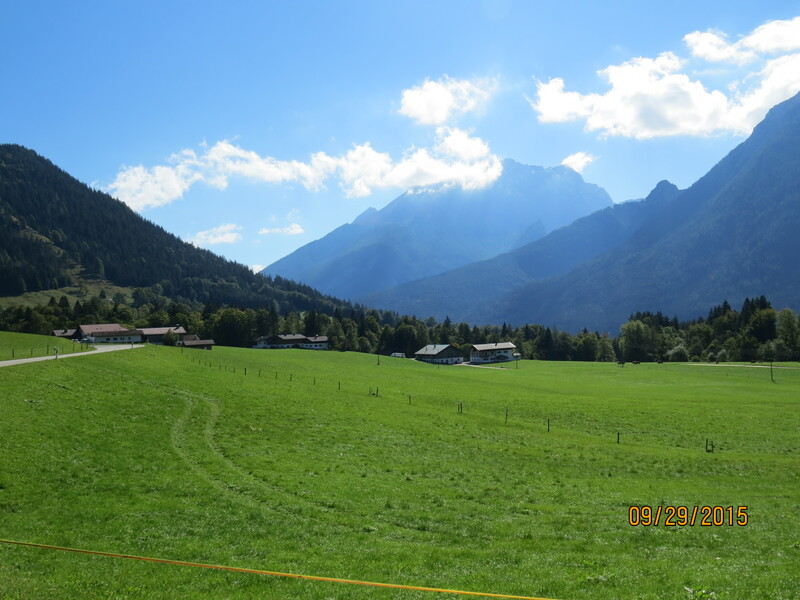 We could still go to Berchtesgaden National Park in the most southeastern part of Bavaria, just across the border from Salzburg. 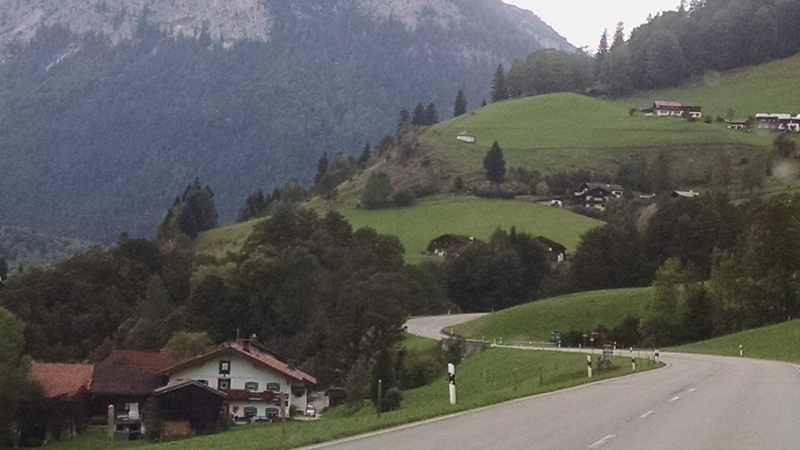 We wanted to drive the Deutsche Alpenstrasse and this seemed a good place to start. 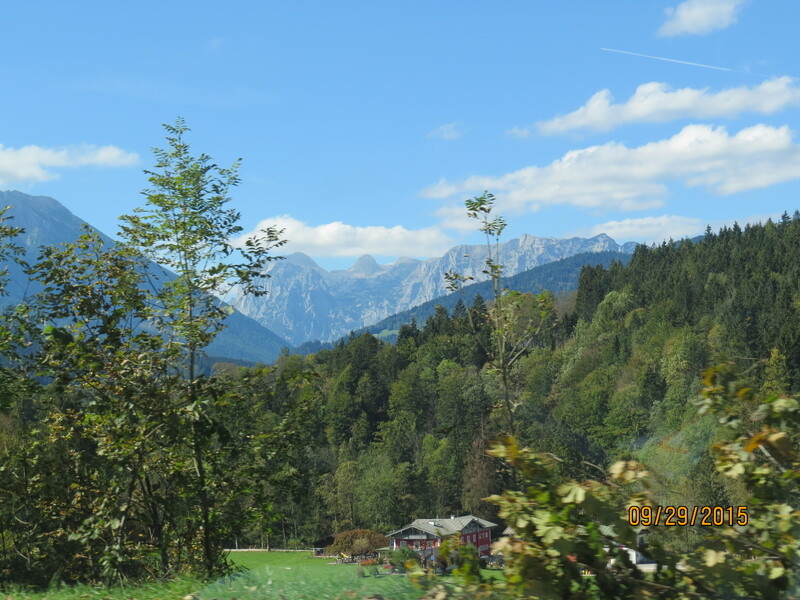 The German Alpine Road winds through lovely Bavarian villages, with spectacular views of the Chiemgau Alps around one curve, followed by breathtaking views of lakes, and meadows around the next. I was mesmerized as I watched the cows on the mountainsides and listened to the tinkling of their bells! I remember my mother telling how when she purchased a cow bell when she was in Bavaria in the early 1970’s, the gentleman selling it asked how big her cow was! Now that made sense! Berchtesgaden is a National Park but also made infamous by Adolf Hitler. “The Eagle’s Nest,” (so named by the American Military) was Hitler’s diplomatic house. It was presented to him by the National Socialist Party (NS) as a gift to commemorate his 50th birthday. The brass shafted elevator’s original purpose was to transport Hitler to his mountain-top residence in comfort (although he rarely stayed there). After reading the information pamphlet, I really didn’t want to see it. I think it was the phrase, “the Eagle’s Nest is a unique historical building and monument to the NS period” that made realize I didn’t need to tour it. I could see it high atop the mountain from where I stood and that was enough. Bob agreed! Instead we took an electric boat on Lake Konigssee (the King’s Lake) to St. Bartholoma Island. The focus of this island is the chapel of St. Bartholoma which dates to the 17th century. Bavarian Kings have used it as their hunting castle. And until the beginning of the 19th century it was the summerseat for the prince abbots of Berchtesgaden. As pretty as the island is, it was the boat trip that took our breath away. It’s about a 30 minute ride that’s steeped with history. In one place a small red cross marks the memorial of a boating accident in 1688. 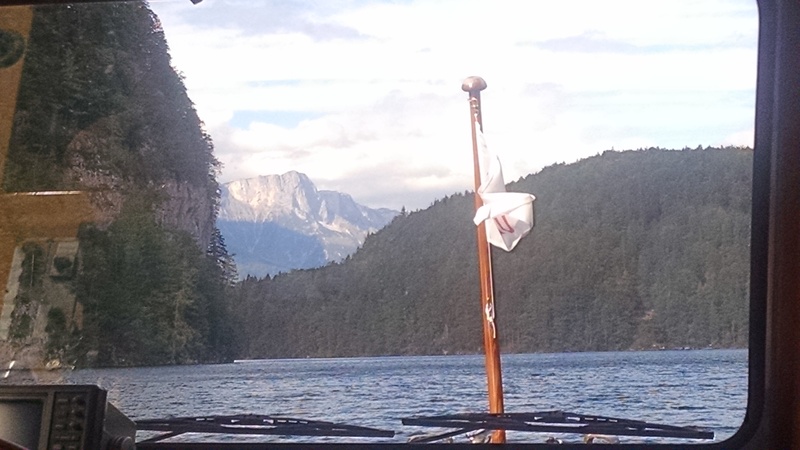 The boat then passes Watzmann Mountain which represents King Watzmann, the second highest peak Queen Watzmann and the peaks in between represent their children. Legend has it that because the king was very cruel God turned the whole family to stone. About a third of the way to the island we came to a Cliffside called Echowand, famous as the name suggests, for the echo of Konigssee. Here the boat captain stopped the boat, switched places with another driver, and the captain proceeded to the side of the enclosed boat, opened the windows and stepped up to the narrow edge of the boat and began to play his flugelhorn. If you listen closely you can hear the echo! It’s said that in earlier times boat captains would shoot off hand canons and the shot would repeat 7 times! Heading back to Prien along the German Alpine Road we realized the views were equally beautiful, but very different, from our drive east that morning. 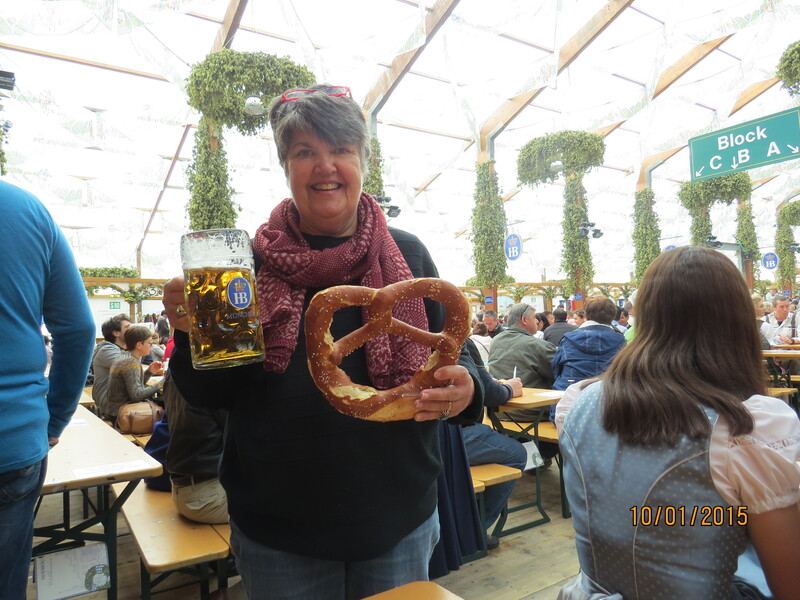 Later in the week, we headed to Munich for a day at the Oktoberfest! The train was packed…at 10 o’clock in the morning. People in traditional dress, more than a few already enjoying a brew. The festival dates back to the marriage of King Ludwig to Princess Therese October 12, 1810. The citizens of Munich were invited to the celebration which was held in the fields in front of the city gates. The name of the field Theresien means Theresa’s meadow. Later it was shortened to Wiesn, now synonymous with Oktoberfest. When we got off the train, we saw signs along the street indicating the way to Wiesn, but signage wasn’t needed, we just followed the crowd to the giant party. Admission is free. More than 7,700,000 litres of beer are consumed during the 16 day festival. 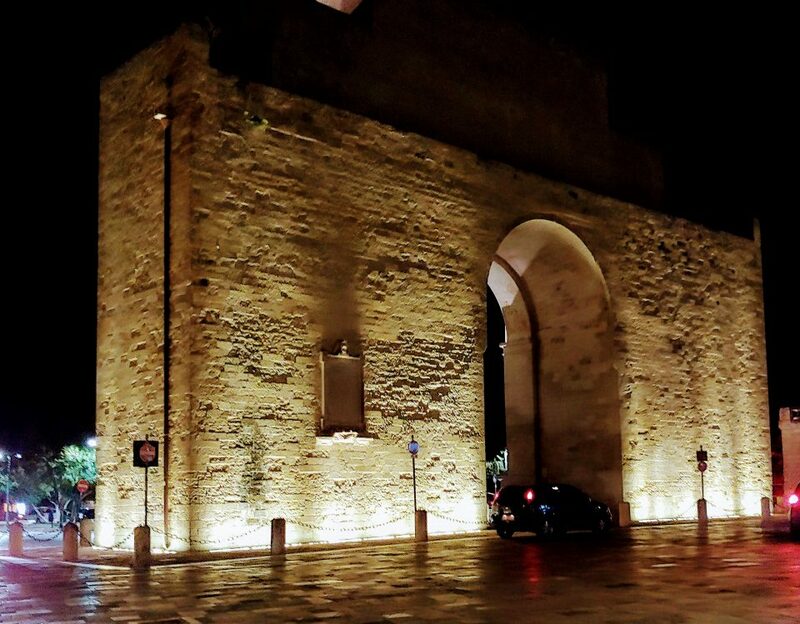 The festival brings in more than a billion euros to the city during this period! There are 14 beer tents, each holding thousands of people. We had read that spots would be reserved from 3 pm on but before that people generally find some place to sit. We headed to the Hoffbrau tent and found a place to sit down and enjoy a beer. In spite of the crowds, the Germans have dealt with this giant party in their usual efficient way. A waitress was with us within a few minutes. At first we thought the prices were steep, but as we thought more about it we figured a one litre beer cost 10.30€…that’s probably not any more expensive than a beer at a professional sporting event in the States. 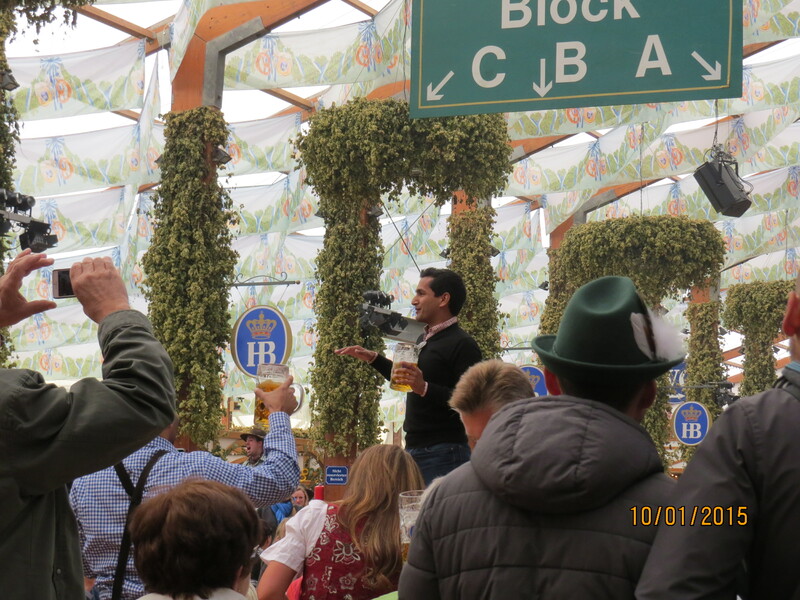 Oktoberfest is fun! There are oompah bands everywhere, people chugging beers to the cheers of the people around them. There are amusement rides, food stands, beer tents, kiosks selling all sorts of souvenirs. And people from all over the world mob the midway! My wife Joan and I are on somewhat the same trajectory as you. We left Ohio in November for Costa Rica, then Colombia; then in February to Spain, then we are spending 4 months in the Algarve of Pourtugal. I enjoyed your blog and we have had some of the same challenges, but we still have our home! Our biggest blessing is that locals and other travelers help and share with us great tips. I just saw the leasing option, so tried some scenarios. I was coming up with about $1500 per month and up. If that is not right, let me know how to do better, please. You must book over i think 21 days for a great discount, but worth it. I have paid as low as 5 Euro per day and up to 10 Euro per day depending. The key is to search from the countries web site you are in- so you get local pricing. I use a VPN that I pay about $50 per year that is the best investment. You can pick the country you wish to use, so when i have business in the USA, I pick USA. If I want a cheap flight from Colombia, I choose Colombia. If I am in USA and want to rent a car in Faro or Lisbon, Portugal, I would use my Portugal location. Otherwise the rental cost is over twice as much if you come in from another country. Also, I have an excellent credit card ( happens to be Capital One Signature Visa from USA) that covers insurance, so that saves a bundle, plus I get points I can turn to cash. PS: We agree with you- we have stayed in about 20 airbnb’s and 95% are good to great experiences. Acutally, I acquired a new twin “sister” who was our host in Costa Rica. She was born same day and year as myself; and neither of us had ever met anyone with our identical birthdays before! We still stay in touch! I’m sorry I didn’t reply earlier Daniel. I’m pleased you commented and not sure how I missed it! Yes, our wanderings are very similar. We too use the Capital One and it’s been fabulous for us. (We use it just like a checkbook running virtually every expense through it and paying it off every month.) We are currently enjoying the UK and Ireland for our 90 days out of Schengen. Amazing how much history we’re learning. We feel very fortunate to be able to see so much of the world. Stay safe and enjoy!